When will be Kirawareru Yuuki next episode air date? Is Kirawareru Yuuki renewed or cancelled? Where to countdown Kirawareru Yuuki air dates? Is Kirawareru Yuuki worth watching? Ando Ranko is a police detective. She is single and has no boyfriend currently. Even though she is only 32 years old, Ranko is extremely capable at her job. With a track record of solving many difficult cases, she is regarded as one of the top detective of Metropolitan Police Department. She doesn't listen to others' advice, never cares what others think about her and does things the way she wants to.Ranko starts working with a new partner Aoyama Toshio. Toshio, who has long dreamt of being a detective, has a strong sense of justice and is the complete opposite of Ranko. He cares what others think of him and tries hard not to be disliked. Working side by side with Ranko, Toshio comes to hate her for her arrogant attitude and willful behaviors. 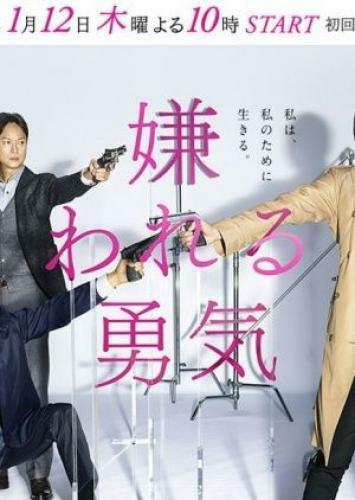 Will "the world's most disliked female detective" and her overly self-conscious partner be able to learn to co-exist with each other and get their job done? Kirawareru Yuuki next episode air date provides TVMaze for you. EpisoDate.com is your TV show guide to Countdown Kirawareru Yuuki Episode Air Dates and to stay in touch with Kirawareru Yuuki next episode Air Date and your others favorite TV Shows. Add the shows you like to a "Watchlist" and let the site take it from there.